Saturday of Nebula Weekend involved a lot more talking to fabulous people. I started the day with an in-depth discussion on the Return of the Jedi with the super-awesome Shanna Swendson and Elizabeth Wein. I then went out for a lovely lunch with Shanna. The weather was perfect, and we ate Mexican food outside at one of Shanna's old college haunts. So much fun! Returned to the hotel in time (almost) for the SFWA Business Meeting. All the active members had to sign in. You should have seen this attendance sheet. My name was sandwiched between Joe Haldeman and Shanna Swendson. Hee-hee! I felt like a vandal who had sneaked in and added her name to the signatures on the Declaration of Independence. And then discovered there were secret clues on the back of the Declaration that were only visible with Ben Franklin's special glasses and... Sorry, bad movie reference. Couldn't resist. Okay, wait, back up a bit... yep, just there, to the elevator after I finished putting on my black-and-white vine dress. I walk over to the elevator, and there's a man standing there in coat and tie and jeans. He's not wearing a name tag, but he seems to know what my name tag means, so I guess that he's connected to the event and I say, "Hi, I'm Sarah Beth Durst." And he shakes my hand and says, "I'm Michael Chabon." Yep, Pulitzer Prize winner Michael Chabon, who later that night went on to win the Nebula for Best Novel. We chatted on the way down the elevator, and I led him to registration. He was so super sweet. Plus he seemed genuinely excited to be there. (I mean, at the event, not just the registration desk, though I'm sure he was glad... oh, never mind.) At any rate, I really enjoyed talking with him. After we'd all sufficiently admired each other, we commenced to the banquet. I had an awesome table. Starting on my left: Elizabeth Wein, Gay Haldeman, Joe Haldeman, Diana Gill, Candace Havens, Rosemary Clement-Moore, Anne Sowards, Jack McDevitt, and Liza Groen Trombi. I had a particularly great conversation with Liza, whom I'd never met before. And then after dinner... the awards. Oddly, during dinner, I hadn't thought much about the awards. (I say "oddly" because I was only a few feet away from the trophies. If I hadn't been in heels and, y'know, trying to look professional and all that, I could have grabbed one, tucked it under my arm like a football, and bolted out of the room. Not that the thought crossed my mind or anything.) Anyway, as soon as the emcee stepped on stage, my heart started to pound in this really fast and cliched way. It wasn't a scary sort of nervousness. I knew my chances were astronomically small -- seriously, folks, Harry Potter and the Deathly Hallows, the most popular YA fantasy book since, like, EVER was on the list -- but astronomically small is still not zero. John Moore introduced the award, and Amy Sisson and Chris McKitterick walked across the stage to present. John handed them a black envelope with silver writing on the outside. My heart was thumping so fast and loud that I felt like my skin was vibrating. 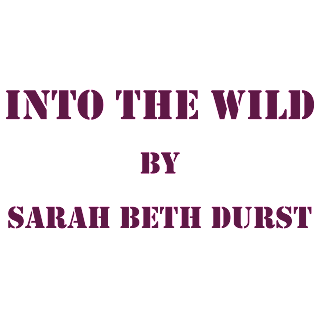 And they said, "And the nominees for the Andre Norton Award are..." And then they got to my name, "... Sarah Beth Durst for Into the Wild..." and they said it just like that, like the presenters do at the Academy Awards. Hearing those words, I nearly started to levitate. A moment later, they sliced open the envelope with a sword-shaped letter opener and read the name "J.K. Rowling." The funny thing was that I kept smiling. I still felt like flying. My name had been announced as a finalist! I had to remind myself to quit smiling for at least a couple of seconds so that I didn't look like one of those idiots on award shows that acts overly-excited when someone else wins. Don't get me wrong -- I wanted that award. (See above plan for grabbing the trophy and bolting.) But how could I be sad? I was there! I got to be a finalist! The only thing I was sad about was that the announcement of the award meant the experience was nearly over. My heart rate calmed as I listened to the rest of the awards and speeches. 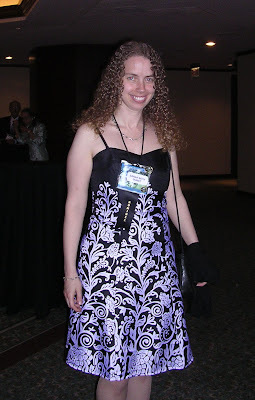 In addition to J.K. Rowling for the Norton, the 2007 Nebula winners were Michael Chabon for Best Novel, Nancy Kress for Best Novella, Ted Chiang for Best Novelette, Karen Joy Fowler for Best Short Story, Guillermo del Toro for Best Script, and Michael Moorcock as SFWA Grand Master. Afterwards, everyone gathered in the hospitality suite to talk, shoot pool, and bean each other with the foam moon-like balls given as party favors at the banquet. Really, I think it shows remarkable decorum and self-restraint that we didn't pelt each other with those balls during the banquet. Next morning, I checked out. By lucky coincidence, the super-sweet Sean Fodera was on the same flight as I was so I got to continue my streak of talking-with-fabulous-people all the way back to New York. And last but certainly not least, a shout-out to the awesome Austin science fiction community... Karen Meschke (the fearless leader of the Nebula Awards Weekend committee), Sandy Del Monte (the tireless Hospitality Suite Goddess), Laura Domitz, Lillian Butler, Lee Martindale, Beverly Hale, Cherly DuCoin, Stina Leicht, and all the other wonderful people who organized everything for this event. Thank you for an incredible weekend! 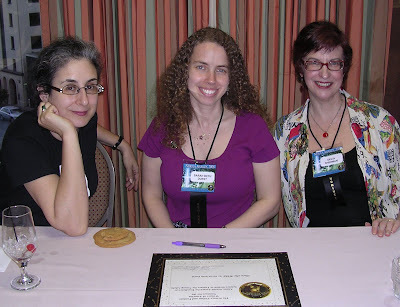 Anyway, Voldemort did not attend the 2008 Nebula Awards Weekend in Austin. But lots of really amazing people did attend, and I talked to anyone who was foolish enough to make eye contract with the curly-haired girl who was grinning as broadly as a dolphin all weekend. Arrived late. The hotel was overbooked, so they upgraded me to a suite! And this was a "Texas-sized" suite. You entered in Austin, and by the time you reached the bedroom, you were in Houston. It had a living room (with two couches and a dining room table for six), a kitchen (full refrigerator plus washer and dryer), a walk-in closet, two bedrooms, and three bathrooms. Significantly larger than many apartments I've lived in. I then returned downstairs and tried to keep from doing cartwheels across the hotel lobby while the little Sarah inside my head was shrieking, "Nom-i-nee! Nom-i-nee! Nom-i-nee!" in a very cheerleader-esque fashion. Late afternoon, I checked out the room for that night's mass autographing. The booksellers from BookPeople were all set up, and they had two giant stacks of the paperback edition of Into the Wild. I didn't even know the paperback existed yet! It's not due out until May 29th. But there it was! I did a little Snoopy Dance of Joy before remembering that I'm supposed to look professional. Oops. I talked with more fabulous people: Delia Sherman, Ellen Kushner, Rosemary Clement-Moore, Candace Havens, Shanna Swendson, Elizabeth Wein, Geoffrey Landis, Gordon Van Gelder... I'll show pictures in just a second, but first... the Nominee Ceremony! After the ceremony, I was lucky enough to sit between Delia and Ellen for the autographing session. The answer to "what more can a little Sarah ask for" turned out to be dinner. Candace (Candy), Rosemary, Elizabeth Wein, A. Lee Martinez (Alex), and I ventured out into Austin for dinner, and I had the most fantastic time. I adored my dinner companions. I even got extra bonus time with them -- after dinner, it began to rain. And when I say "rain," I mean that the Hoover Dam broke over our heads, and the entire Colorado River crashed down on Austin in a torrent of water. We hid out in the restaurant lobby until the dove, the rainbow, and Noah said it was safe again. Tomorrow, I am hopping on a plane (and by "hopping" I mean that I'm arriving at the airport several hours early and staring fixedly at the Arrival/Departure board in hopes that by sheer force of will, I can prevent the flight from being delayed or cancelled -- I am not what you'd call a relaxed traveler) and flying to Austin, Texas, for the 2008 Nebula Awards Weekend. As I think I've mentioned (only about a hundred times), Into the Wild is a finalist for SFWA's Andre Norton Award for Young Adult Fantasy and Science Fiction. I am really, really, really excited about this. In fact, as soon as I got the news, I booked my flight to Austin, where they will be announcing the winner, live, at the awards ceremony! Just like the Oscars! Sorta. Don't misunderstand -- I am not expecting to win. I am up against some really stiff competition (Elizabeth Wein, Ysabeau Wilce, Steve Berman, Adam Rex, Nnedi Okorafor-Mbachu, and some unknown writer by the name of J.K. Rowling). But I am ridiculously excited to lose in person. And to wear a pretty dress. I can't remember the last time I wore a dress. Writing isn't really a dress-wearing sort of job, which is probably a good thing because I can't walk in high heels for more than five minutes at a time and I haven't the faintest idea how to put on makeup. (Last time I wore makeup was at my wedding ten years ago. I still own that makeup. It's probably all turned toxic by now.) But I went to the mall five times to find the perfect dress for this weekend. Finally found it last week. Snoopy Dance of Joy! Do ya like it? Do ya? Do ya? Now I just need to make it through the banquet without spilling anything on myself. So not going to happen. It's open to everyone, regardless of whether you're attending the awards ceremony, so if you're in Austin this weekend, I hope you'll stop by! Last weekend, I attended New York Comic Con, the second largest pop culture conference in the country. The exhibit hall spanned the bulk of the Javits Center in NYC and included booths specializing in books, comic books, graphic novels, manga, movies, anime, TV, and video games. I was there for three days, and I never did manage to walk down all the aisles. This actually has less to do with the size of the convention and more to do with the fact that I'm easily distracted by shiny things. And there were lots of shiny things. And lots of books. I told myself not to pick up too many books so I wouldn't cut off all circulation in my arms when I tried to lug my bags home. But who can resist the lure of free books??? - Friday night, hung out with many super-cool and super-awesome people before, during, and after Cassandra Clare's signing, including Cassie Clare, Holly Black, Theo Black, Barry Goldblatt, Karen Wojtyla, and Paul (from S&S). Heard many hilarious anecdotes and got to read a couple pages of a draft of Holly's next novel, The White Cat. It's AWESOME. - On Saturday, thanked Terry Brooks. Eleven years ago, I attended his signing at the MIT Coop Bookstore. He was the very first real author I'd ever met, and he was extraordinarily kind. He talked to me for forty-five minutes about writing and the writing business. He encouraged me and inspired me, and I have been wanting to say thank you ever since. This Saturday, I got the chance to tell him what an impact his kindness had on my life. And I got to give him a copy of my book!!! - Also on Saturday, hung out with fellow Razorbill author Sam Enthoven (read his trip report) and his girlfriend Laura. Much as I love their cool London accents, I wish they lived in NYC instead of London so that I could see them more often. They're very awesome. (I also got to see them last night -- I dragged them both to Teen Author Drinks Night, a monthly get-together of YA authors in NYC. As always, lots of fun, and this month I got to meet the super-fabulous Jennifer Barnes for the first time.) Also on Saturday, had a great breakfast with Jeri Smith-Ready, author of the wicked-cool novel Wicked Game. (Breakfast itself wasn't so exciting -- just an ordinary blueberry muffin -- but the company was wonderful. Jeri's totally great.) Last but not least on the name-dropping list: the sweet and uber-talented Shannon Hale (read her trip report). Visited her during her signing and gushed at her about how brilliant her Book of a Thousand Days is. - Sunday, did my signing at the Penguin booth. Sunday was Kids Day at NY Comic Con, so I got to sign for a mix of kids and grownups. I love, love, love signing. Makes me feel like I'm sharing a story with a friend, even if it's someone I've never met before and will never meet again. Also, it's just plain cool. :) Several of my writer friends stopped by, including Keith DeCandido. Keith is an excellent writer who I've known for a decade. Through the years, he's always been so sweet and encouraging. So it meant a lot to have him there. - And last but certainly not least, I had a great time chatting with the awesome folks at the Penguin booth. Lisa DeGroff was the superhero who worked the booth the full weekend and organized my signing and a million other things. I don't think she stopped moving once all weekend! And I had lots of fun hanging out with the fabulous editorial team from Razorbill: Jessica Rothenberg, Ben Schrank, and Laura Schechter. It was so cool of them to be there. And as an extra bonus, I got to see the super-nice Anne Sowards from Ace (who just happens to be a fellow member of the Curly Mafia). A fun, fun, fun weekend all around. This weekend, I'm off to New York Comic Con, a huge convention, held at the Javits Center in NYC, celebrating comics, books, movies, and all manner of things about which people like to dress up in outrageous and awesome outfits. Should be lots of fun! I'll be signing at the Penguin booth (#1941) on Sunday (4/20) at 1pm. If you'll be at NY Comic Con too, I hope you'll stop by and say hi! The winner for best T-shirt design is... Enna Isilee!!! Congratulations Enna Isilee, and thanks for the fabulous design! I'm so excited about this. I already uploaded the images to Cafe Press, setup T-shirts of a couple different styles and colors to be sold at the base price (no mark-up), and just like that, we've got T-shirts! Available right now! Crazy. The wonders of the internets never cease to amaze me. Click here -- www.cafepress.com/sarahbethdurst -- to check 'em out. Enna Isilee, please email me and let me know (A) your mailing address and (B) which style shirt you'd like in what size, and I will send you a shirt plus an ARC of Out of the Wild. Hope you like them both. Okay, may I have another drumroll please? As promised, we have a second winner. The winner of the random drawing is... Kelly013!!! Congratulations, Kelly! (And thanks for your entry, which was also awesome.) Please email me your mailing address, and I'll send you an ARC of Out of the Wild as well. Thanks again, everyone! I had a lot of fun with this. It's here! It's time for the Out of the Wild ARC contest!!! Yes, I'm bouncing up and down as I type this. You see, for months now, I've been mulling over the idea of doing a contest to give away an ARC (Advanced Reader Copy) or two of my next book. I've visited lots of other writers' blogs -- purely for work purposes, of course, not procrastination (hah!) -- and seen their contests and been green with contest-envy. But now... it's time! I'm also excited because of what I'm going to ask you guys to do to win. Hee-hee! Oh, the power! It corrupts! Seriously, though, I got the idea for this contest from Miss Erin, so you can praise/blame her. 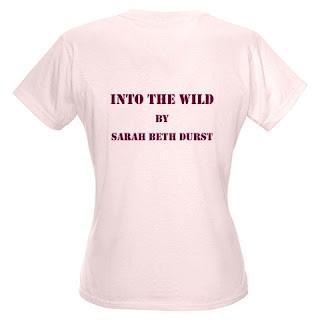 After she reviewed Out of the Wild, she mentioned that she wanted the T-shirt that various characters wear in the novel. The shirt in Out of the Wild has silver glitter letters that read, "Northboro: Fairy-Tale Capital of the World". Rapunzel (Julie's mom) hates it, though Gillian doesn't understand why. "It doesn't give away any secrets," Gillian said. "Just please don't wear it again." "I wish you'd trust me," Gillian complained. I wish you'd understand, Julie thought. Something as awful as fairy tales didn't belong on a T-shirt. But I disagree with Julie. I think there should be T-shirts!!! 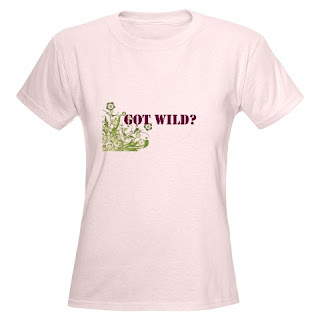 So... welcome to the first ever Wild T-Shirt Design Contest! 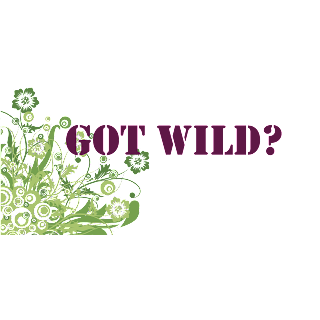 Create a T-shirt design for Into the Wild or for Out of the Wild (or both)! It can be words, a picture, or words and a picture. It can say "Northboro: Fairy-Tale Capital of the World". Or not. It can mention the book titles. Or not. It can include your favorite phrase or sentence from Into the Wild. Or not. It can refer to your favorite character. Or not. It can be simple or ornate. It can be funny or serious. Whatever you think would make a great T-shirt! For some examples/ideas, take a peek at the Tamora Pierce T-shirts available here on Cafe Press or the T-shirts in the sidebar of Bookshelves of Doom. As I am a firm believer that success in anything requires equal parts skill and luck, two winners will be selected, one for skill and one for luck. The "skill" winner will be the person whose T-shirt design is my favorite. The "luck" winner will be chosen at random from all the entries, so the more you enter, the better your chances! Each of the two winners will receive an advanced reader copy (ARC) of Out of the Wild! The best design(s) will be made available as T-shirts on Cafe Press! And if I use your design for a T-shirt, I'll buy you one of those T-shirts. You can enter as many times as you like. To enter, please create an image (that could be printed on a T-shirt) and either (A) post it somewhere online and put a link to it in the comments to this blog entry, or (B) email it to me and leave a comment here telling me that you did. The image should be either a PNG or high-quality JPG file, and it should be 2,000 by 2,000 pixels in size (in other words, 10 x 10 inches at 200 dpi). If you want the printed image to be a shape other than square, make the background transparent. You can use any words, phrases, or names from Into the Wild that you want. If you choose to use graphics, please do not use any copyrighted images. (This means that you can't use the cover art for Into the Wild or Out of the Wild -- sorry!). If you do not wish to make a T-shirt design but still want to be entered to win the "luck" drawing, please simply post a comment and say you'd like to enter. You've got until the night of Tuesday April 15th to submit your designs. The winners will be announced on Thursday April 17th. This weekend, I will be a program participant at I-Con, a science fiction and fantasy convention in Stony Brook, NY. I'm really excited because (A) I'm on cool panels with cool people, including a panel with Peter Beagle (!!! ), author of The Last Unicorn and other gorgeous/brilliant books, and (B) it's just two miles from my house, so this should be the easiest journey to a convention EVER. 11am Panel - Helen Collins, Wendy Delmater, Debra Doyle, Sarah Beth Durst, Drew Henriksen - "Pursuing Perfection: The Art of Revision"
2pm Panel - Peter S. Beagle, Sarah Beth Durst, Carol Emshwiller, John Peel, Patrick Thomas - "Making Fantasy Real"
5pm Panel - Sarah Beth Durst, Drew Henriksen, John Peel, Patrick Thomas - "I'd Never Miss a Book By..."
Thank you to everyone who submitted entries to the LOL-Aslan contest! I loved reading all of them. So did Perni (my cat). It was hard to choose a winner. I know that sounds cliched, but it was seriously hard. I'm the kind of girl who can agonize for a solid hour about which nearly-identical pair of black pants to wear. If I'm faced with a decision where there are multiple equally-good answers, I'm doomed. And there were lots of excellent choices here. Perni also had problems choosing a winner. The plan was simple: I write down the names of entrants on little pieces of paper and place them in a circle around Perni. She walks toward one of them, and that person wins. Execution of the plan... not so simple. I wrote down the names, placed them in a circle around Perni, and sat back to watch the action. Perni ignored the paper, rolled onto her back, and licked her belly. 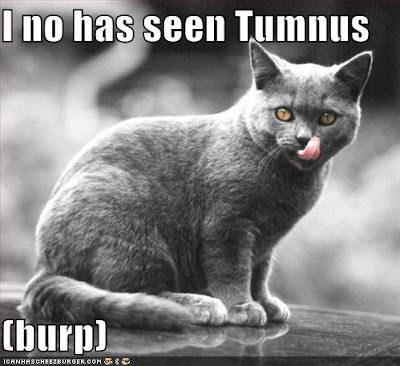 For some cats, this is a short one-lick-and-done process. Not so with Perni. She must align every single hair on her fuzzy belly. When she finishes that, she moves onto her tail, which of course disturbs her belly fur... Rinse, lather, repeat. So once she started on the licking, I knew we were in for the long haul and I went to fetch myself some soda. Yeah, that was a mistake. When I returned, the cat was gone, and the papers were scattered about the room like confetti. But as I collected the papers, I realized that Perni had indeed selected her winner: one of the pieces of paper was half-eaten. Congratulations, Faith and Susan! Please email me your mailing address, and I will send you each a copy of Through the Wardrobe: Your Favorite Authors on C. S. Lewis's Chronicles of Narnia, edited by Herbie Brennan and including an essay by yours truly.